Mom, the Intern: Layer like the Sister Wives. Layer like the Sister Wives. Did you think I'd forgotten about the 30 Day Challenge? Well, I hadn't forgotten, but I was definitely putting it off. There, I said it. I was getting super-dee-duper tired of the same shirts and was ready to give up. Twenty-eight outfits made from 21 pieces is quite admirable, I think. But I don't want to be a lame-o quitter. So here I am. Finishing out the challenge. One more to go! I just finished watching two seasons of Sister Wives on Netflix. What a strangely enjoyable show. I can't imagine sharing my husband with three other women. Actually, I can't imagine co-existing under the same roof with three other women. Waaaay too much estrogen for one location, methinks. Anyway, have you noticed how wives Meri and Robyn like to layer short-sleeved tops over long-sleeved tops? I kinda like it. I guess it depends on the top, but it's an easy way to vary your outfits and bring a little fall flavor to your style. Yup, I just admitted that the Sister Wives inspired this outfit. Ka-ching! But at least I don't take my cues from Disney princes. That would just be weird. Ahhh that sister wives show...so freaky. So addicting. i just finished watching it too, and i thought the same thing about their layering skills. haha! you look good! 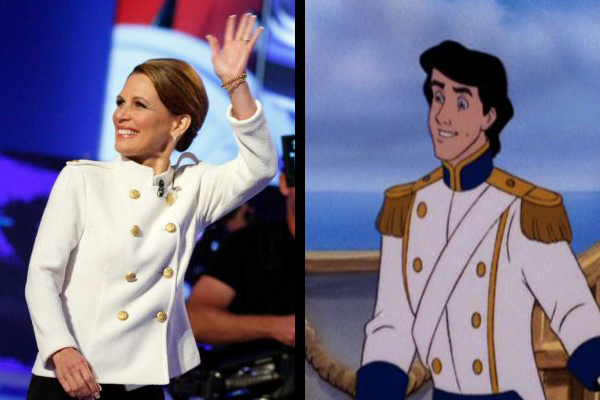 I love Michelle Bachman as Prince Eric! So hilarious!! Those Sister Wives LOVE THEM some layers! I have thought that many times! SO funny. You're adorable! You look darling. I like the layering look. It makes total sense when you change things up. I love Sister Wives too! Such an interesting and addicting show!! sister wives freaks me out. we had the debate on, and someone on twitter called her captain crunch. we died laughing. prince eric is even closer though, haha!